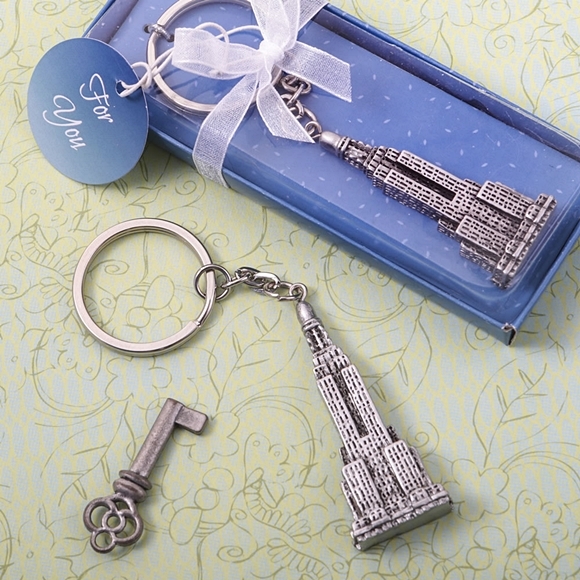 Dimensions: 4 1/8" x 3/4" x 3/8"
This Empire State Building skyscraper charm is made of poly-resin and hand-painted in an antique silver finish. The charm is attached to a silver metal chain and silver key ring. The keychain comes beautifully packaged in a clear gift-box with a blue stage. The gift-box is finished with a white organza ribbon and bow. Attached to the bow is a blue 'For You' tag. PLEASE NOTE: Sold individually. Pictured vintage key is not included.